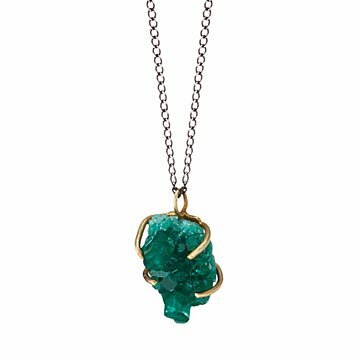 This stunning emerald pendant is the product of a fascinating experiment. It's hard to believe that the intense pigment of these gemstones didn't come from deep within the earth. Rather, they're crafted through a unique process in which an emerald's natural elements are baked in a pressure cooker for 11 months. When the lid comes off, the stones are sourced by designer Emilie Shapiro and set in a recycled brass prongs to create a stunning work of wearable art. Unlike mining, the development is completely sustainable and leaves the precious crevices of our planet in tact. 18-inch recycled brass chain. Each piece will vary slightly due to the uniqueness of the crystals. Handmade in New York City. Make it a set! Click here to see the matching Emerald Crystal Earrings and Emerald Crystal Ring.